← Sack It To Me! Robata Jinya is one of my new favorite restaurants and my favorite robata bar in Los Angeles. 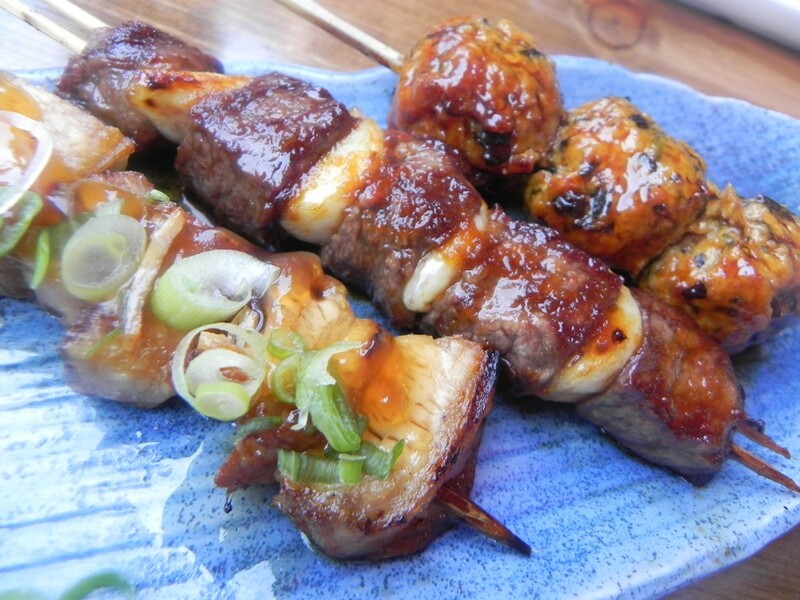 A robata bar specializes in skewers of meat and vegetables which are cooked on a charcoal grill, often after marinating in a special sauce. It’s a style of cooking that originated in rustic farmhouses around the city of Sendai in Northern Japan. The skewers at Robata Jinya are small and most are only two or three dollars so you can try lots of different things. 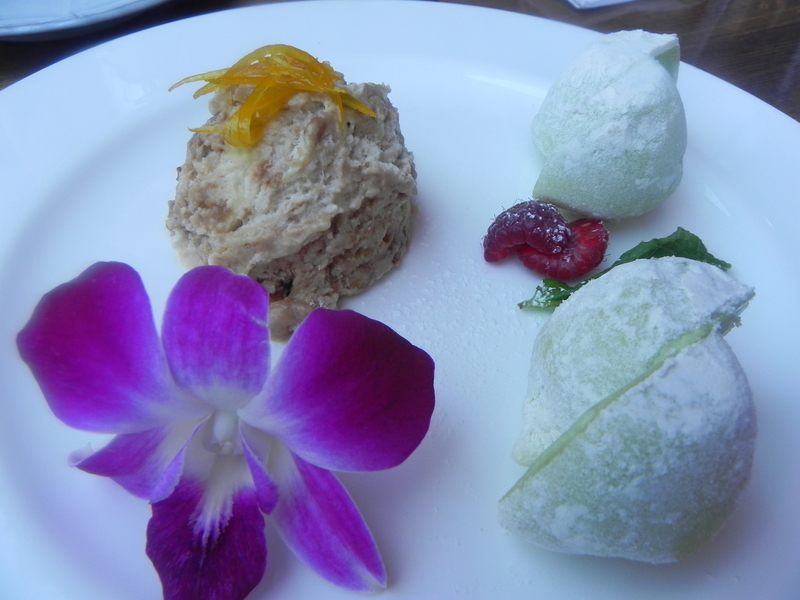 My favorites are the Tsukune (perfectly seasoned chicken meatballs), the Prime Beef and Garlic (made with a yummy Japanese soy garlic sauce), and the Chasu Pork (soy-braised pork belly which is glazed to perfection). All three are pictured above. 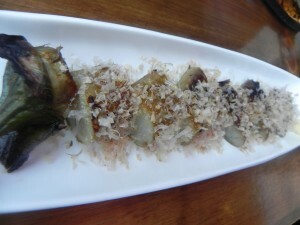 I also love the grilled eggplant, which is beautifully plated and sprinkled with bonito flakes. The robata here is not only delicious, most of it (pork belly aside) is ideal if you’re watching your weight, avoiding heavy carbs and trying to “eat clean” and exercise portion control. But Robata Jinya is much more than just robata. 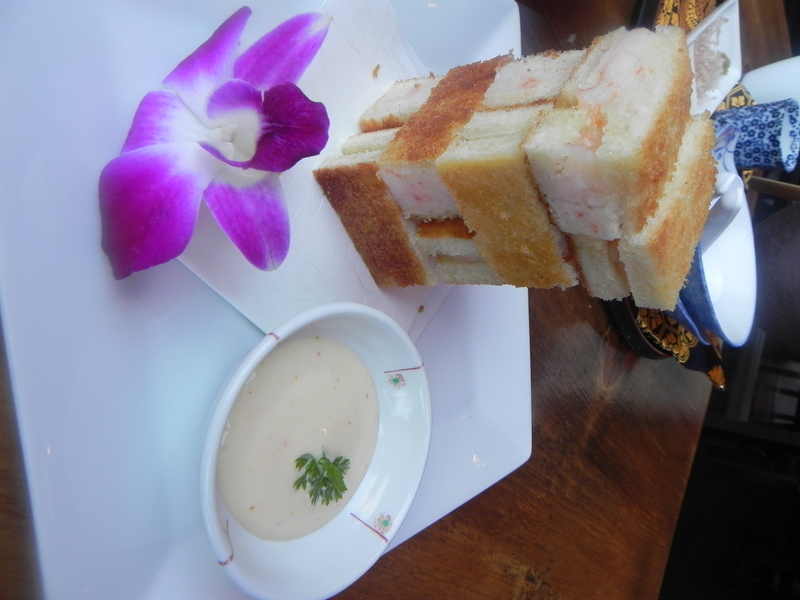 They have an extensive menu of sushi, as well as awesome appetizers such as the Shrimp Toast (delicious bite size sandwiches arranged like a game of Jenga) and really great gyoza (pork dumplings). 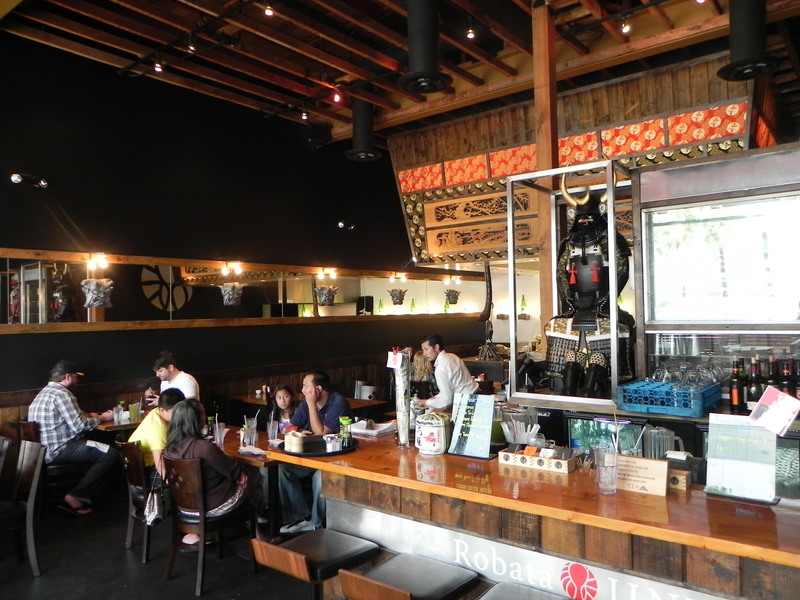 They also have incredible ramen, which is not that surprising since their sister restaurant, Ramen Jinya in Studio City, is one of the best ramen places in LA. 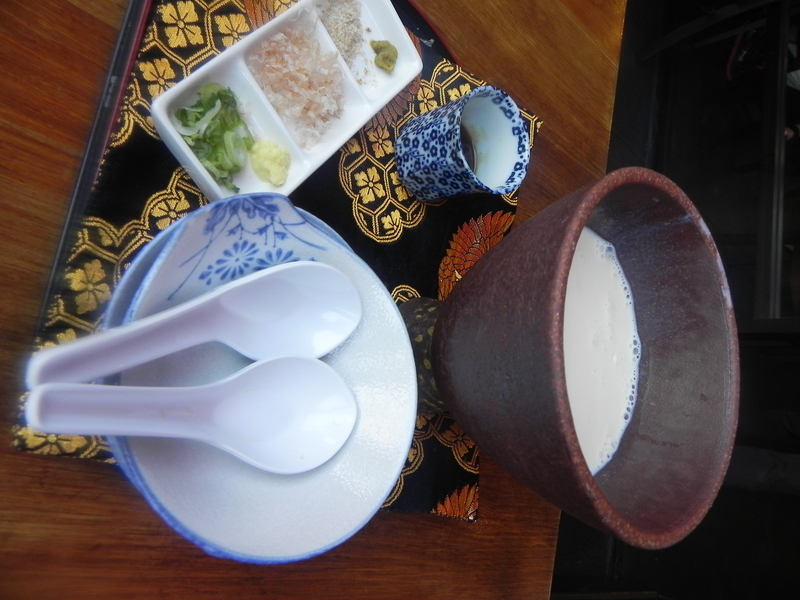 But the one non-robata dish which is a must-have is the Homemade Organic Tofu, which is made instantly right in front of you. 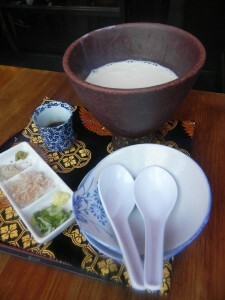 The waitress will pour warm soy milk from a pitcher into a bowl. 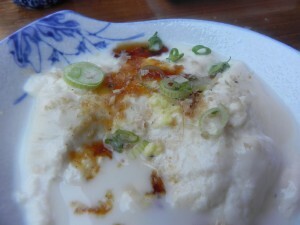 After about five minutes, the liquid forms into a custard-like soft tofu. You are given bonito flakes, grated ginger and ponzu sauce to add on top. It is incredibly delicious! And of course fun. I could seriously eat here everyday. Robata Jinya is located at 8050 West 3rd Street, Los Angeles (in Mid-City near West Hollywood). 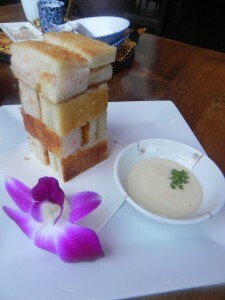 Tofu is made at your table! That looks amazing! Will definitely go try it out.